The children have had an early Easter treat making chocolate cakes! We hope you have a lovely Half Term! The children have made a mask of their pets they have at home. The children have drawn their pets today and wrote instructions on how to look after them. The children have enjoyed trying a new snack in After School Club this evening. The children have had fun drawing their mums tonight. Working together to design a Cross. First day of Spring and the children have had fun in the sun with lots of different sports equipment, lets hope this sunshine stays! The children followed a sheet to learn how to wrtie their name in Sign Language. Our poems and pictures about the Seaside. Some more poems the children have created tonight, tonights theme was the JUNGLE! Some great Under The Sea poems made by the children. Make sure you keep an eye out for more poems we will be doing this week! Some great Book Covers designed by the children tonight for World Book Day. Maya Jayne was proud to show After School Club her Gymnastic Certificates. Well Done! When we return after half term, we shall be doing activities about Friendship. Make sure you look in the cloakroom for upcoming activities we will be doing in After School Club too. We hope you have a great half term :)! The children enjoyed trying a different range of Chinese Food tonight. We have made some beautiful Chinese Lanterns tonight! What fun the children have had tonight making their own Chinese New Year Masks! The children have made their own Skeleton tonight! We had lots of fun outside drawing round our friends with chalk, we then went back in to draw the human body and labelled the parts we knew. Some beautiful puppets made by the childrent tonight! 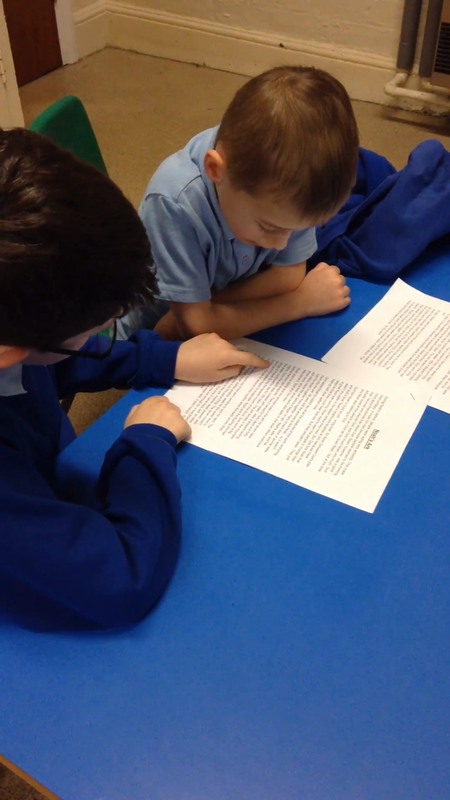 The children have worked with partners writing their own scripts, they have then acted out their stories to the other children in After School Club. It was great seeing what the children came up with and the confidence they have when acting! Great start to our Story Telling Week. The Children have wrote their own stories independently, here are some examples. The children have created their own Adam and Eve storyboards, to end our Religious week. The Children have made their own prayers to be put round school and one special prayer for Mrs Stanley WainWright. Make sure you look round school for your prayer! Some of the amazing creative writing pieces made today. Well done! Some of the many drawings that the children created today. The children have been reading to one another about Noah's Ark. The Children have been drawing and decorating church's tonight as part of our Religious Week. The start of After School Club's Religious week. The children have made the seven days of creation in the form of crosses. The children have enjoyed there trip down to the ECO Garden having the chance to go bird watching and putting out there bird feeders they made yesterday. What a fun week After School Club have had making and learning about birds. The children have been outside today, making their own bird feeders. Ready for our trip on Friday to the ECO Garden. We have been busy making our own chocolate bird nests tonight! Children are making binoculars ready for bird spotting in our ECO garden Friday.